Jeremy Martin of Wiseco-backed Team GEICO Honda lined up on the Supercross starting gate for the East West showdown of the season. Despite a season of struggle, he's kept his focus, and came out in front of all the best 250 riders in the series. 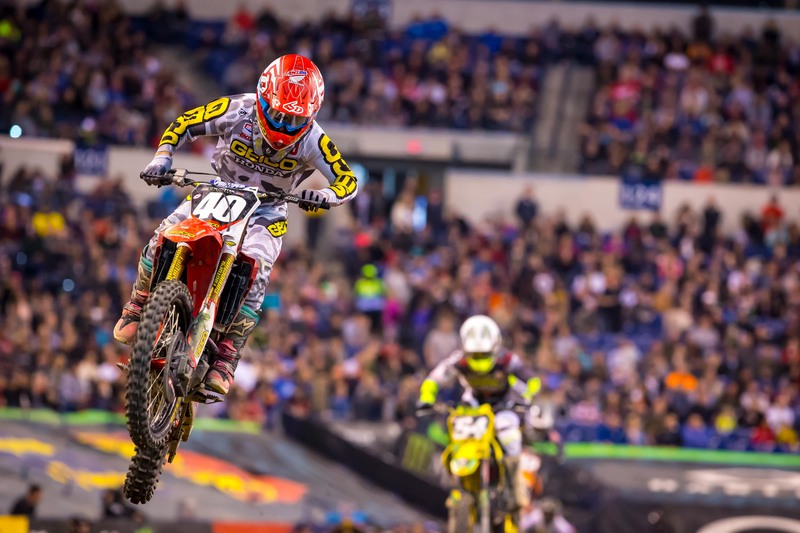 MENTOR, Ohio (March 27, 2018) – Jeremy Martin showed the way for the Wiseco Brigade in Saturday night’s Monster Energy AMA Supercross, an FIM World Championship, at Lucas Oil Stadium in Indianapolis. 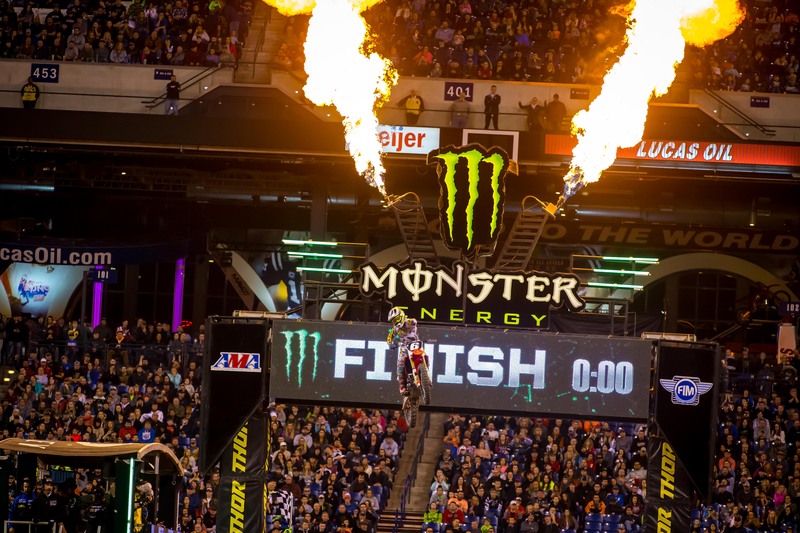 The Indianapolis Supercross marked the first of two 250SX East/West Showdowns, with riders from both the Western Regional and Eastern Regional 250SX classes coming together to compete for bragging rights. It was a night dreams are made of for Martin, as the rider of the No. 6 GEICO/AMSOIL/Factory Connection Honda CRF250R turned in a flawless ride from start to finish. Martin scored the holeshot, set the pace from flag-to-flag and collected his first win of 2018. Jeremy Martin lit the candles for the first time this year. Martin is currently fourth in the Eastern Regional 250SX Class championship point standings and trails leader Zach Osborne by 19 markers with five races remaining on the 2018 schedule. “I got the holeshot and rode good for a little bit,” explained Martin who earned back-to-back runner-up finishes at the previous two rounds. “Then I saw the boys behind me. The track was pretty tricky. I’m not going to lie. I had a couple sketchy moments out there. I saw Luke (Renzland) was in second. I kind of looked around. I kind of just was trying to maintain it. I had a couple close calls. But we were able to lead from start to finish and have a good race." "This is just a blessing to be able to be out here so I've got to give it up to the Man Up Above. I'm doing what I love to do and I've got a dream team. It was a great race. I got the holeshot, and then I just rode my own race and raced the track. That's why we put in the time during the week and suffer." On the flip side, Martin’s GEICO Honda teammate and Western Regional 250SX Class regular Chase Sexton had a night he’d rather forget. Sexton was caught up in multiple on-track incidents and ultimately unable to finish the race. Indy was a rough round for Sexton, but he's not letting it alter his focus on the next round. Across the paddock in the premier 450SX class pits, Team Honda HRC’s Christian Craig continued to get acquainted with the bigger machine while filling in for his injured Honda teammates Ken Roczen and Cole Seely. Craig endured his own set of challenges Saturday night, but despite being held up in the first corner and going down on two separate occasions during the 20-minute-plus-one-lap main event, the rider of the No. 32 Honda CRF450R managed to salvage a 16th-place finish. Monster Energy AMA Supercross will enjoy its first weekend off since the season began in January before saddling up in two weeks for the final five-race stretch to close out the 2018 campaign. Round 13 from Seattle’s CenturyLink Field will be televised live on FS1 Sat., April 8 beginning at 10 p.m. Eastern Daylight Time, 7 p.m. Pacific.